We are both very much in love with each other after four years, but each of us, though committed to the other, sometimes worries that the other might be unfaithful. Neither of us believes that he/she will, yet each of us does sometimes worry and at these times our otherwise beautiful relationship suffers. Are there indications that either of us has anything to worry about in our respective charts? Somebody told us there is on both sides, because each of us has a Venus Uranus square. A Venus-Uranus square does not force you to cheat on your partner. It does suggest that you need to take an unconventional approach to relationships, or that you need a fair amount of space in a partnership, as Uranus rules the need to disrupt the status quo and express one’s uniqueness. Venus also rules art and money, so a Venus-Uranus square could just mean that you have unpredictable finances or that you create paintings that challenge the mainstream, for example. Your Venus in consistent yet possessive Taurus, making a tight 90-degree angle (or square) to Uranus. However, a trine from reliable Saturn to your Venus adds a taste for commitment. Your girlfriend’s Venus is in experimental Aquarius, which is more independent than your Venus placement — but this may just mean that she really needs to spend time with friends. Her love planet is nine degrees away from an exact square to her Uranus, which I think is too large of an orb to take seriously. She may have a wounded sensuality due to her Venus’ square to Chiron in Taurus. Her Mars in Pisces is opposed by Saturn, which may put the reigns on her sexual expression. Your girlfriend’s Venus is in a tight opposition to your natal Uranus, suggesting a relationship that must accommodate freedom and change. Any astrological aspect has many forms of expression. Although the signs and house placements/rulerships of the planets provide the details regarding how an aspect manifests in action, we all have the power to make conscious choices. As long as both of you (especially you, with the Taurus Venus) give each other room, you won’t feel driven to sleep with someone else just to assert your individuality. 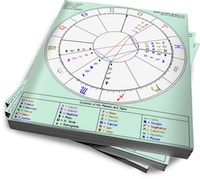 Comment below: Do you have a Venus-Uranus aspect? How do you express it? Thank you for this post! Not because I have Venus square Uranus or anything, but because you reemphasize the fact that one aspect, sign, or house placement does not dictate one’s future. With all things in life, I think it’s important to look at the larger relationships vs. focusing on one piece of the puzzle. This post is a good reminder of that. Consider that plenty of people are unfaithful *without* any Venus square Uranus in their charts. I wonder if there’s some reason you both worry. You don’t need to tell me either. I’m just thinking that if I worry about something a lot it stems from something. It can be, ( one reason in my case), insecurity. Because trusting one person completely and not permitting myself the option to seek solace from someone else when angry and disappointed in my spouse, was very difficult for me. I knew that was the right course of ation, but I felt very unhappy and needy at times in our early years…so I worried. Also, when I was young, I had many loves- my first husband and I were monogamous, but we were both polyamorous for many years prior.So, may former way of life was something that I was ambivalent about for some time. Also, once an affair has *already* occurred, it is something that haunts us no matter how much water has passed under the bridge by now. So again, if either of you’ve been unfaithful before–even in another relationship–it may be difficult to know it will not necessarily happen again. 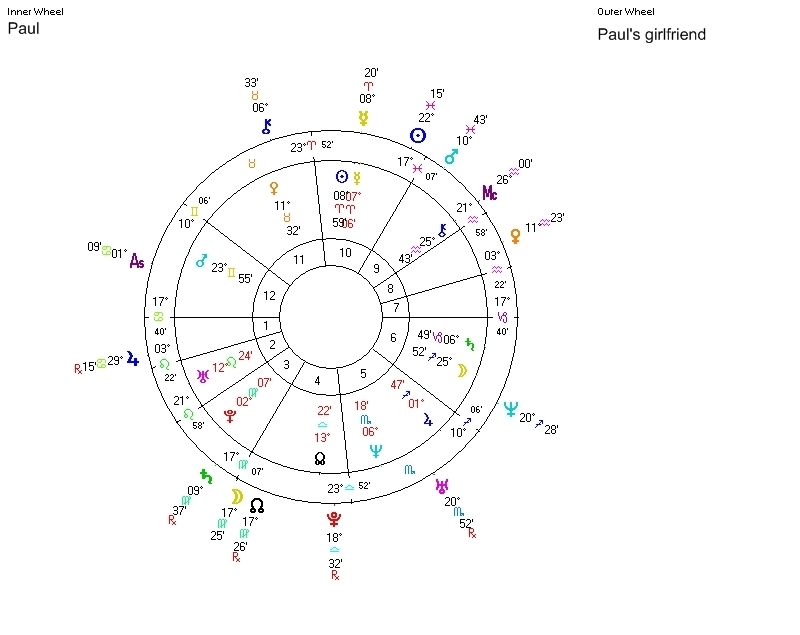 Your gf has, from what I see, a Moon -Sun opposition, so she has areas of inner conflict she herself needs to work out. (her inner self versus her more general outward self). Don’t worry aout something happening beore there’s any reson to think so at all. It might be for example(since I don’t know you and she)that one or you or both of you tend to look at or fantasize abut others…but this is not at all cause for alarm. When it is something that’s really more of a temptation to be acted on–you can always choose not to–no matter what Paul –it will pass. Venus/Uranus square means the challenge is to mix things up a bit, keep it unpredictable and a little left-field. If things get too boring then yes, the temptation to have an affair will be there. So, don’t let it get boring! Wake him up at 3 am and bite his neck then work your way down. Show up at his office with no underwear and do it in the elevator between floors. Throw him a curveball when he least expects then disappear, cliffhanger style. Every challenging square has a bright side and Venus/Uranus helps keep things fresh. And insane, but so what? You’re consenting adults. Temporary insanity can be quite tasty in prescribed doses.